Always Active is a wellness program for seniors over the age of 60 that strives to improve health, fitness, maintain independence and a high quality of life. 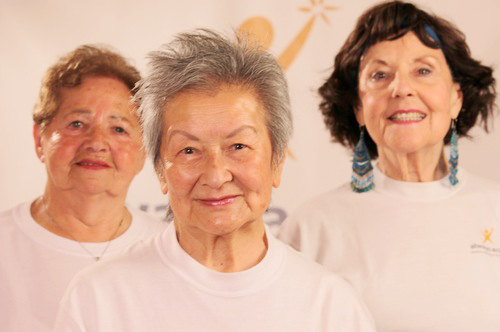 We pride our unique services in being easily accessible through neighborhood centers, multi-lingual for a diverse population of seniors, and financially feasible by being donation based. Our instructors are nationally certified, professional exercise leaders who conduct classes specifically for older adults based on science evidence programs. The program is FREE for qualifying seniors. We may only ask for a minimal donation of $25, one time during the year when you enroll. No one is denied services if unable to donate. Always Active can help you achieve better health through regular exercise to enhance your muscular strength and flexibility. We also offer workshops to prevent falls, and ongoing education on various health topics. 1) Talk to the Always Active staff/volunteer at your center to pick up a registration and physician’s release form. You must submit a physician’s release form in order to be registered and participate in the classes. 3) Bring your center membership card (if applicable) to your appointment, and a $25 donation(optional). Any comfortable, exercise appropriate clothes will do. If it’s cold, wear several layers of light clothing, which you can remove as needed. Athletic shoes with good padding, arch supports, and uppers that allow air to circulate around your feet are ideal. What is the Schedule of classes? Check with the Always Active Staff/volunteers at your center for the schedule of Basic and/or Advanced Strength and Flexibility classes, and Fall Prevention Programs.